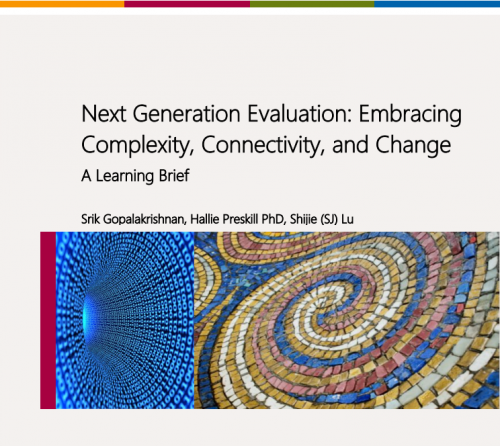 This Learning Brief draws from literature and research, as well as more than a dozen interviews with foundation leaders, evaluation practitioners, and social sector thought leaders, with the intention of starting the conversation in the field around Next Generation Evaluation characteristics and approaches. Over the last several years, the public and philanthropic sectors have been developing and experimenting with new and creative approaches to solving social problems in response to the increasing recognition that complex problems require complex solutions. Some of these efforts may be described as truly experimental, in that they are using new untested practices or models, making serious attempts to affect systems change, and using innovative technologies to improve the social well-being of many. At the same time, the evaluation field has been evolving in ways that are more pluralistic, inclusive, and increasingly multi-disciplinary. The interest in, and commitment to, strategic learning, evaluation capacity building, and timely and useful information, all bode well for ensuring that evaluation continues to be an indispensable tool for decision making and action. However, as the social sector continues to innovate, it will be ever more important for evaluation to evolve and grow in ways that respond to the increasingly complex, inter-connected, and rapidly changing world in which these initiatives live. In this Learning Brief, we draw from literature and research, as well as more than a dozen interviews with foundation leaders, evaluation practitioners, and social sector thought leaders to start the conversation around what we at FSG have come to call Next Generation Evaluation. The conversation will continue at the Next Generation Evaluation conference at Stanford University on November 14, 2013, and beyond the conference through additional publications and blogs. We invite you to join us in this journey as we explore the next frontier of evaluation and learning.